Strategic bombing is a military strategy used in total war with the goal of defeating the enemy by destroying its morale or its economic ability to produce and transport materiel to the theatres of military operations, or both. It is a systematically organized and executed attack from the air which can utilize strategic bombers, long- or medium-range missiles, or nuclear-armed fighter-bomber aircraft to attack targets deemed vital to the enemy's war-making capability. One of the strategies of war is to demoralize the enemy, so that peace or surrender becomes preferable to continuing the conflict. Strategic bombing has been used to this end. The phrase "terror bombing" entered the English lexicon towards the end of World War II and many strategic bombing campaigns and individual raids have been described as terror bombing by commentators and historians. Because the term has pejorative connotations, some, including the Allies of World War II, have preferred to use euphemisms such as "will to resist" and "morale bombings". The theoretical distinction between tactical and strategic air warfare was developed between the two world wars. Some leading theorists of strategic air warfare during this period were the Italian Giulio Douhet, the Trenchard school in the United Kingdom, and General Billy Mitchell in the United States. These theorists were highly influential, both on the military justification for an independent air force (such as the Royal Air Force) and in influencing political thoughts on a future war as exemplified by Stanley Baldwin's 1932 comment that the bomber will always get through. 1.1 Development of the term "terror bombing"
Aerial attacks described as terror bombing are often long range strategic bombing raids, although attacks which result in the deaths of civilians may also be described as such, or if the attacks involve fighters strafing they may be labelled "terror attacks". German propaganda minister Joseph Goebbels and other high-ranking officials of the Third Reich frequently described attacks made on Germany by the Royal Air Force (RAF) and the United States Army Air Forces (USAAF) during their strategic bombing campaigns as Terrorangriffe – terror attacks. [nb 1][nb 2] The Allied governments usually described their bombing of cities with other euphemisms such as area bombing (RAF) or precision bombing (USAAF), and for most of World War II the Allied news media did the same. 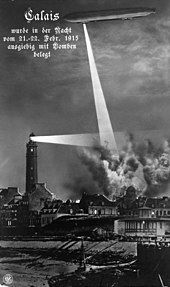 However, at a SHAEF press conference on 16 February 1945, two days after the bombing of Dresden, British Air Commodore Colin McKay Grierson replied to a question by one of the journalists that the primary target of the bombing had been on communications to prevent the Germans from moving military supplies and to stop movement in all directions if possible. He then added in an offhand remark that the raid also helped destroy "what is left of German morale." Howard Cowan, an Associated Press war correspondent, filed a story about the Dresden raid. The military press censor at SHAEF made a mistake and allowed the Cowan cable to go out starting with "Allied air bosses have made the long awaited decision to adopt deliberate terror bombing of great German population centres as a ruthless expedient to hasten Hitler's doom." There were follow-up newspaper editorials on the issue and a longtime opponent of strategic bombing, Richard Stokes, MP, asked questions in the House of Commons on 6 March. The strategic bombing conducted in World War II was unlike anything the world had seen before. The campaigns conducted in Europe and Asia could involve hundreds of aircraft dropping thousands of tons of conventional bombs or a single aircraft dropping a nuclear weapon over a single city. Strategic bombing campaigns were conducted in Europe and Asia. The Germans and Japanese made use of mostly twin-engined bombers with a payload generally less than 5,000 pounds (2,300 kg), and never produced larger craft to any great extent. By comparison, the British and Americans (who started the war with predominantly similarly sized bombers) developed their strategic force based upon much larger four-engined bombers for their strategic campaigns. The payload carried by these planes ranged from 4,000 lb (1,800 kg) for the B-17 Flying Fortress on long-range missions, to 8,000 lb (3,600 kg) for the B-24 Liberator, 14,000 lb (6,400 kg) for the Avro Lancaster, and 20,000 lb (9,000 kg) B-29 Superfortress, with some specialized aircraft, such as the 'Special B' Avro Lancaster carrying (22,000 lb (10,000 kg)) Grand Slam. 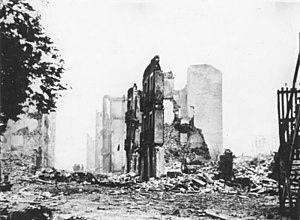 The United States Army Air Forces adopted a policy of daylight precision bombing for greater accuracy as, for example, during the Schweinfurt raids. That doctrine, based on the erroneous supposition that bombers could adequately defend themselves against air attack, entailed much higher American losses until long-range fighter escorts (e.g. the Mustang) became available. Conditions in the European theatre made it very difficult to achieve the accuracy that had been possible using the exceptional and top-secret Norden optical bombsight in the clear skies over the desert bombing ranges of Nevada and California. Raids over Europe commonly took place in conditions of very poor visibility, with targets partly or wholly obscured by thick cloud, smokescreens or smoke from fires started by previous raids. As a result, bomb loads were regularly dropped "blind" using dead-reckoning methods little different from those used by the RAF night bombers. In addition, only the leading bomber in a formation actually utilized the Norden sight, the rest of the formation dropping their bombs only when they saw the lead aircraft's bombload falling away. Since even a very tight bomber formation could cover a vast area, the scatter of bombs was likely to be considerable. Add to these difficulties the disruptive effects of increasingly accurate anti-aircraft fire and head-on attacks by fighter aircraft and the theoretical accuracy of daylight bombing was often hard to achieve. Accuracy, described as "pinpoint", never exceeded the best British average of about a 3 mi (4.8 km) radius from point of aim in any case. [page needed] Postwar, German engineers considered bombing of railways, trains, canals, and roads was more harmful to production than attacks on factories themselves, Sir Roy Fedden (in his report on a postwar British scientific intelligence mission) calling it "fatal" and saying it reduced aeroengine production by two thirds (from a high of 5,000 to 7,000 a month). Strategic bombing was initially a way of taking the war into Europe while Allied ground forces were unable to do so. Between them, Allied air forces claimed to be able to bomb "around the clock". In fact, few targets were ever hit by British and American forces the same day, the strategic isolation of Normandy on D-Day and the bombing of Dresden in February, 1945, being exceptions rather than the rule. There were generally no coordinated plans for around-the-clock bombing of any target. Strategic bombing in Europe never reached the decisive completeness the American campaign against Japan achieved, helped in part by the fragility of Japanese housing, which was particularly vulnerable to firebombing through the use of incendiary devices. The destruction of German infrastructure became apparent, but the Allied campaign against Germany only really succeeded when the Allies began targeting oil refineries and transportation in the last year of the war. At the same time, strategic bombing of Germany was used as a morale booster for the Allies in the period before the land war resumed in Western Europe in June 1944. In the Asiatic-Pacific Theater, the Imperial Japanese Navy Air Service and the Imperial Japanese Army Air Service frequently used strategic bombing over Asian cities such as Shanghai, Guangzhou, Nanjing, Chongqing, Singapore, and Rangoon. However, the Japanese military in most places advanced quickly enough that a strategic bombing campaign was unnecessary, and the Japanese aircraft industry was incapable of producing truly strategic bombers in any event. In those places where it was required, the smaller Japanese bombers (in comparison to British and American types) did not carry a bombload sufficient to inflict the sort of damage regularly occurring at that point in the war in Europe, or later in Japan. A U.S. Air Force F-100C practices a nuclear bombing run. In the Korean War, the United States Air Force (USAF) at first conducted only tactical attacks against strategic targets in Korea. Because the Korean War was widely considered a "limited war", the Truman Administration prohibited the USAF to bomb near the borders of China and the Soviet Union in fear of provoking the countries to enter into the war. The Chinese intervention in the war in November 1950 changed the aerial bombing policy dramatically. In response to the Chinese intervention, the USAF carried out an intensive bombing campaign against North Korea to demoralize the North Koreans and inflict as much economic cost to North Korea in order to reduce their ability to wage war. The extensive bombing raids on North Korea continued until the armistice agreement was signed between communist and UN forces on July 27, 1953. During the 2008 South Ossetia war Russian aircraft attacked the shipbuilding centre of Poti. ^ Barrett Tillman (2014). Forgotten Fifteenth: The Daring Airmen Who Crippled Hitler's War Machine. Simon and Schuster. p. 35. ISBN 978-1-62157-235-0. ^ Overy 2005, p. 119. ^ Myrdal 1977, p. 252. ^ Axinn 2008, p. 73. ^ Algeo 1993, p. 111 "Terror Bombing. Bombing designed to hasten the end of a war by terrorising the enemy population—1941 Read. Dig. June p. 58/2 ..."
^ Oxford English Dictionary, terror,n, "terror-bombing, intensive and indiscriminate bombing designed to frighten a country into surrender; terror raid, a bombing raid of this nature". ^ Brower 1998, p. 108 (mentions that Historian Ronald Shaffer described Operation Clarion, an operation that involved both bombing and strafing, as a terror attack). ^ Kochavi 2005, p. 172. ^ Taylor 2005, pp. 413,414. ^ Siebert, Detlef. "British Bombing Strategy in World War Two", 1 August 2001, BBC, retrieved 8 January 2008. ^ a b Taylor 2005, p. 430. ^ Taylor 2005, p. 434. ^ Flight staff 1914, p. 906. ^ Spencer Tucker; Laura Matysek Wood; Justin D. Murphy, eds. (1999). The European Powers in the First World War: An Encyclopedia. Taylor & Francis. p. 13. ^ Tim Benbow, ed. (2011). British Naval Aviation: The First 100 Years. Ashgate Publishing, Ltd. p. 29. ^ Castle, Ian (August 2017). "Strategic Bombing: Gothas over London". Military History Monthly. ^ O'CONNELL, ROBERT L. (1990). "The Gotha Bomber and the Origins of Strategic Bombing". MHQ Magazine. ^ Doerr, Paul W. (1998). British Foreign Policy, 1919–1939. Manchester University Press. p. 16. ^ Robert Pape (1996). Bombing to Win: Air Power and Coercion in War. Cornell UP. p. 60. ^ Beau Grosscup (2006). Strategic Terror: The Politics and Ethics of Aerial Bombardment. Zed Books. pp. 21–35. ^ Grosscup (2006). Strategic Terror: The Politics and Ethics of Aerial Bombardment. p. 55. ^ a b Hayward 2009, p. 37. ^ Hayward 2009, pp. 53-54. ^ Hayward 2009, p. 54. ^ Omissi 1990, Page needed. ^ Overy, Richard (2013). The Bombing War - Europe 1939–1945. Allen Lane. ISBN 978-0-713-99561-9. ^ Fitzsimons 1978a, p. 1736. ^ Fitzsimons 1978b, p. 1736. ^ Fitzsimons 1978b, p. 1697. ^ Fitzsimons 1978b, p. 1700. ^ Grayling, A. C. (2011-11-07). Among the Dead Cities: Is the Targeting of Civilians in War Ever Justified?. A&C Black. ISBN 9781408827901. ^ Carter, Ian (June 2018). "WHAT DID FIGHTER COMMAND DO AFTER THE BATTLE OF BRITAIN?". Imperial War Museum. ^ Carter, Ian (February 2018). "RAF BOMBER COMMAND DURING THE SECOND WORLD WAR". Imperial War Museum. ^ Conclusion to the Singleton report 20 May 1942 (Copp 1996). ^ Christopher, John. The Race for Hitler's X-Planes (The Mill, Gloucestershire: History Press, 2013), p.77 and 100. ^ Cosgrove, Edmund (2003). Canada's Fighting Pilots. Dundurn. p. 135. ^ Guillemin, Jeanne (2017). Hidden Atrocities: Japanese Germ Warfare and American Obstruction of Justice at the Tokyo Trial. Columbia University Press. pp. Chapter 2 Spoils of War - Secret Japanese Biological Science. ISBN 9780231544986. ^ Reichhardt, Tony (March 2015). "The Deadliest Air Raid in History". AIRSPACEMAG.COM. ^ Kennedy, David M. (2003). The American People in World War II: Freedom from Fear, Part Two. Oxford University Press. p. 421. ISBN 9780199840052. 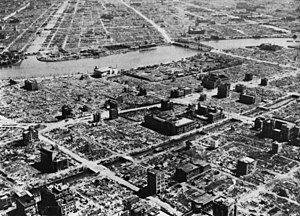 ^ "Deadly WWII U.S. firebombing raids on Japanese cities largely ignored". The Japan Times. March 2015. ^ Wayne Thompson and Bernard C. Nalty (1996). "Within Limits - The U.S. Air Force and the Korean War" (PDF). Defense Technical Information Center. ^ "KOREAN WAR 1950-1953" (PDF). National Museum of the US Air Force. ^ FUTRELL, ROBERT F. (February 1983). "The United States Air Force In Korea 1950-1953" (PDF). Defense Technical Information Center. Lewis, Peter M. H. (1994). "B-29 Superfortress". In Grolier Incorporated (ed.). Academic American Encyclopedia. 10. Grolier Incorporated. ISBN 978-0-7172-2053-3. Patler, Nicholas. "Is the U.S. Haunted by Its Nuclear Past? Dropping the atomic bomb crossed a moral threshold." The Progressive Christian (Winter 2009), pp 15-19,36. Patler, Nicholas. "Book Reviews/Essay: A Twentieth Century History of Bombing Civilians, and A History of Bombing." Journal of Critical Asian Studies (March 2011), 153-156.